A cultivar of Fragaria x ananassa Duchesne. ‘Fruit large, slightly hairy, with a neck of an uniform bright scarlet, ovate-conical, occasionally compressed, and when luxuriant the early fruits are cockscomb-shaped. Seeds slightly embedded. Flesh pale scarlet, rich, and juicy, with a very grateful flavour.’ [George Lindley – Orchard Guide p.486/1831]. ‘No fewer than twenty-one synonymes are given to this variety in the catalogue of the fruits cultivated in the Garden of the Horticultural Society; but some of them are easily referable to its proper name, and others either originated in private gardens, where its history was unknown, or were applied by cultivators desirous of assuming credit for the possession of it as a novelty. The publication referred to having nearly dispelled this confusion of nomenclature, it is not thought worthwhile to perpetuate the recollection of it by repeating the synonymes here. The drawing was made in the Garden of the Horticultural Society. It is very generally cultivated, and is found in many gardens of old standing; its origin is unknown, but is certainly British, for it is not found in the gardens of France, and is not the Fraisier Ananas of the writers of that country, as has been sometimes supposed. Its merit and value are universally admitted; and amidst the diversity of opinions which must exist as to which is the best Strawberry known, there receive the greatest number of suffrages to its superiority. In many situations it bears abundantly, in most well, and continues to produce on old beds for several years. It forces well under strong heat.’ [PM t.47/1828]. The synonyms given by George Lindley are in the main repeated here for the sake of historical compleness. According to Don this is a variety of Fragaria grandiflora Ehrh. from Surinam, introduced to Britain in 1759. 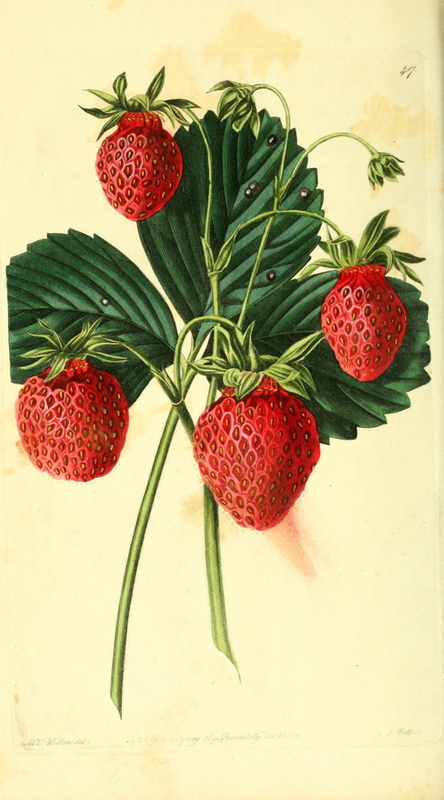 Don also noted that the eminent fruit hybridist T. A. Knight considered F. grandiflora, F. chiloensis, the Chilean Strawberry, and F. virginiana, all of American origin, to be varieties of a single species. Today F. grandiflora is considered to be a variety of F. chiloensis but F. virginiana is kept as a separate species. However, ‘Old Pine’ is much more likely to be a hybrid, as stated here, although the Pomological Magazine casts doubt on this. The alternative is that it is a selection from Fragaria chiloensis (L.) Mill., without admixture. Probably the variety figured as the Pine strawberry in Pomona Brittanica. [PB pl.I/1812]. Listed in all editions of the catalogue as ‘Common Pine Strawberry’ [Strawberry no.1/1843].